A couple days ago I posted a recipe for Pan Seared Thyme Pork Chops and talked about how much I love dishes that have a yummy sauce ladled onto the meat. So, here we are again, with another delicious saucy recipe…this time for chicken! 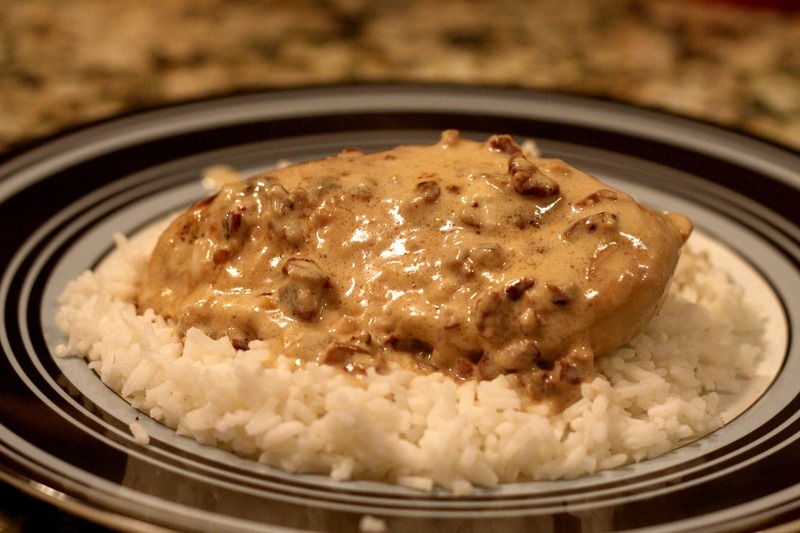 This chicken was super easy to make, and we loved it! As always, the sauce was my favorite part. I even made extra sauce so that I could pour it over the rice, and I’m so glad I did! It was excellent. The orange marmalade gives it a slightly sweet flavor, and the pecans add the perfect dose of crunchiness! I also want to take a minute to give a shout-out to Stephanie over at Plain Chicken. I’ve posted several recipes from her blog, and I’ve enjoyed every one of them! She posts lots of great family-friendly recipes, and you should check her out! Plus, she’s an Auburn grad like me, so ya know she’s awesome. In a large skillet, melt butter. Cook chicken over medium-high heat for 6-8 minutes per side, or until almost done. Remove chicken from skillet. OMG I can’t wait to try this….for some reason it “reads” as delicious as I’m sure it tastes Thank you for sharing all your recipes. Quick question……how can I sign up for email notification of your postings? I don’t want to miss anything.